Google+ added a small feature yesterday that will embed a map preview when you post to Google+ from your mobile device and append your location. The map will only show up if you do not upload a picture with your post. When posting from a mobile device and including the location in the post will now show a map preview in the post with the location name in a box overlay. 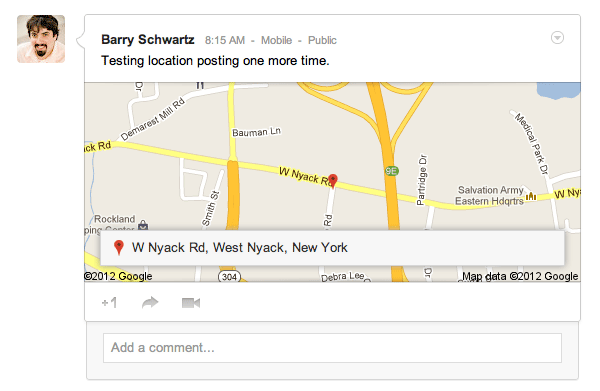 Clicking the name of the place will take you to +Google Maps so you can get a better idea of where it was posted. Before the update, you would only see the name of the location in a hard-to-read grey text colour at the bottom of the post, so it is a nice improvement visually. You can see I tested one with a picture and one without a picture and only the one without a picture had a map.